Various independent sightings confirm that several of "Putin's tigers"—after nearly a year of hiding in the shadows—are alive and well in Amur Oblast Province of the Russian Far East. The first report came near the eve of the New Year from the Khingano-Arkaharinsky Federal Refuge, where Alexander Bochkarev—the former director of Khingansky Nature Reserve—discovered the fresh trail of an adult male tiger. It is speculated that the tracks belonged to one of the released males, Kuzya. Nearly three weeks later, locals reported fresh tiger tracks also belonging to a male near the Khingan River, which marks the boundary between Amur Oblast and the Jewish Autonomous Republic. Around the same time, a villager stumbled across tiger tracks roughly 20 kilometers (approximately 12.4 miles) to the northwest, on the border of Khingansky Nature Reserve adjacent to the village of Kundur. These tracks, however, belonged to a female—possibly Ilona—another in the trio of Putin's tigers. Given the size and trajectory of the tracks, it was evident that this was the same female tiger whose tracks were later discovered by a team of international biologists within Khingansky Nature Reserve. Then on Jan. 19, the staff of Khingansky Nature Reserve received a call from the Russian border patrol, operating at their post on the Russian-Chinese border near the southern edge of Khingansky Nature Reserve. The guards had spotted a large tiger near their post; tracks revealed that the tiger was a large male. Tigers are nothing new in the province of Amur Oblast, where there have been at least 38 documented encounters during the 20th century. The region represents the northwestern-most boundary of the Siberian tiger's range although it had no resident population of tigers. Biologists determined that there was enough game and space to support a small population of tigers, and in May of 2014, Russian President Vladimir Putin released three young tigers, Kuzya, Borya and Ilona in Zhelundinsky Nature Reserve. The tigers continued to make international news after their release when Kuzya crossed over to China and feasted on domestic animals in the winter of 2014. Additionally, evidence indicated that in the summer of 2015, Borya killed and consumed a Himalayan bear. Most recently, Borya charmed the public by fathering three cubs in the Jewish Autonomous Republic. 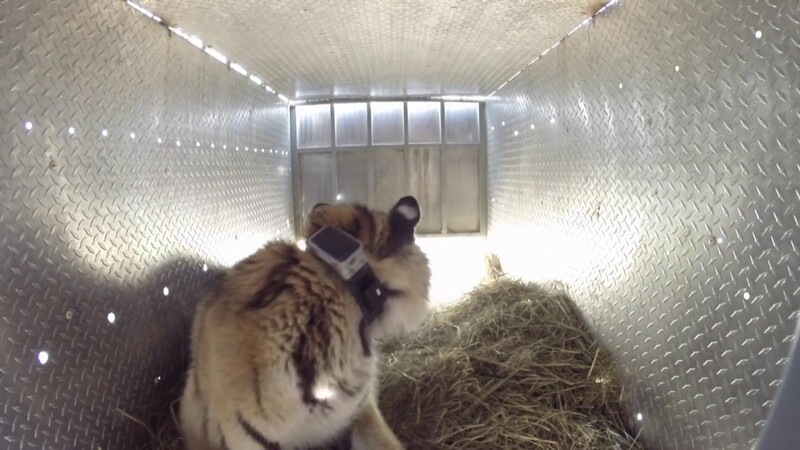 Upon their release into the wild, each of the cats were fitted with GPS collars and transmitters, allowing biologists to track their movements. The collars were designed to provide information on their whereabouts for twelve months past release (May 2015). Signals dropped off for Kuzya and Ilona in the autumn of 2015, but tracks and photos from camera traps indicated that Ilona had settled into Khingansky Nature Reserve in Southern Amur Oblast. The last evidence of any tiger's presence in Amur Oblast was Ilona's tracks in Khingansky Nature Reserve, discovered in February 2017. Evidence of tiger presence has evaded biologists since then, mainly due to the thick vegetation that emerges in warmer months. Winter provides ideal conditions for monitoring mammals, given the lack of foliage and snow cover to preserve tracks. Last December's lack of snow, however, halted the bi-annual mammal census within Khingansky Nature Reserve, leaving a troubling question mark on tiger activities and whereabouts. The tracks and sightings not only indicate the tiger's location, but also provide hints that these tigers have fully assimilated to life in Amur Oblast. For instance, one tiger track indicated that it was stalking a group of wild boars that had recently been feeding on buried equisetum. Scratch marks on trees along the trail also point to territorial practices well beyond common wandering behavior. The 2014 reintroduction of tigers to Amur Oblast is a welcome success to tiger conservation. Although the Siberian tiger population has been increasing over the last several years, there still only remain about 500 individuals in the wild. The growth and expansion of tigers in Russia—along with the willing participation of locals to share information about tiger sightings—is a testament to Russia's commitment to protecting the species. Russia's tiger population represents about 10 percent of all tigers found in the wild.